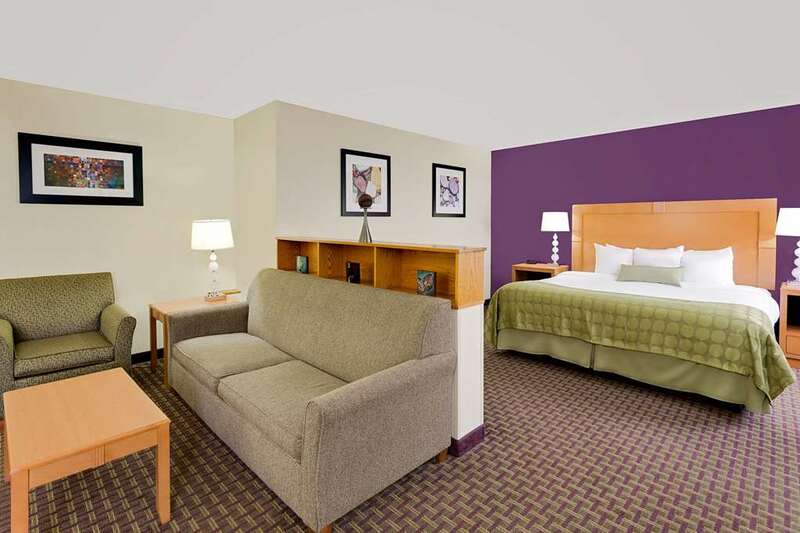 Escape to the Upper Peninsula of Michigan at Ramada Marquette hotel. Conveniently located minutes from the shores of Lake Superior, with easy access to Northern Michigan University and area attractions like Hiawatha National Forest and Sugarloaf Mountain, this lodging facility is also close to Lakenenland Sculpture Park, Marquette Maritime Museum, Marquette Harbor Lighthouse, Marquette Mountain Ski Area and golf at Marquette Golf Club. Amenities include complimentary wireless internet access, indoor pool, sauna, indoor whirlpool, fully equipped business center and meeting facilities. At the end of the day, retreat to a well appointed, non smoking guest room equipped with flat screen satellite TV and coffee maker, a poolside suite with microwave and mini refrigerator, or book a suite with jetted hot tub, ideal for a romantic getaway. Onsite dining is available, and meeting and event facilities for up to 400 people are also available. Dogs are welcome.